For much of my research career I’ve been deeply interested in the techniques that are used to model surface and near-surface drainage patterns using DEMs. Much of this work has focused on DEM processing techniques for handling sinks, such as topographic depressions. Removal of depressions, particularly artifact depressions, from DEMs is a necessary step for most flow-path based hydrological analysis and there is a great deal of research dedicated to developing and testing the methods for this type of flow enforcement operation. For a long time now, however, I’ve been thinking about the opposite problem. Instead of removing depressions from DEMs, how can we add depressions? In fact, artificially damming a site in a DEM is fairly straight forward and simply involves raising the elevations along a dam site. To me, the more interesting problem is how to locate sites in a DEM that, were a dam or dyke of a specified size inserted, would produce an impoundment (i.e. the artificial body of water behind the dam) of a certain size. In other words, can we measure the impoundment size for each grid cell in a DEM based on specified maximum dam/dyke height and length? It turns out that this is a fairly tricky problem which is why I’ve been interested in it for a couple of years now. An impoundment size raster would be very useful for all sorts of applications. For example, it could be used for siting potential wetland restoration projects, monitoring wetland drainage at the landscape scale (presumably using LiDAR DEMs), modelling beaver habitat (or other related aquatic species), siting tailings facilities, hydroelectric dam siting, and many other applications. I feel like the image above should have been slowly revealed with an increasing-tempo drum-line and trumpeted crescendo in the background but sadly these are the limitations of the media. Perhaps you could go to the top of your screen again and slowly scroll downward while humming. As you might expect, the impoundment size is highest in sites with locally convergent topography and extensive relatively low-lying upslope areas. 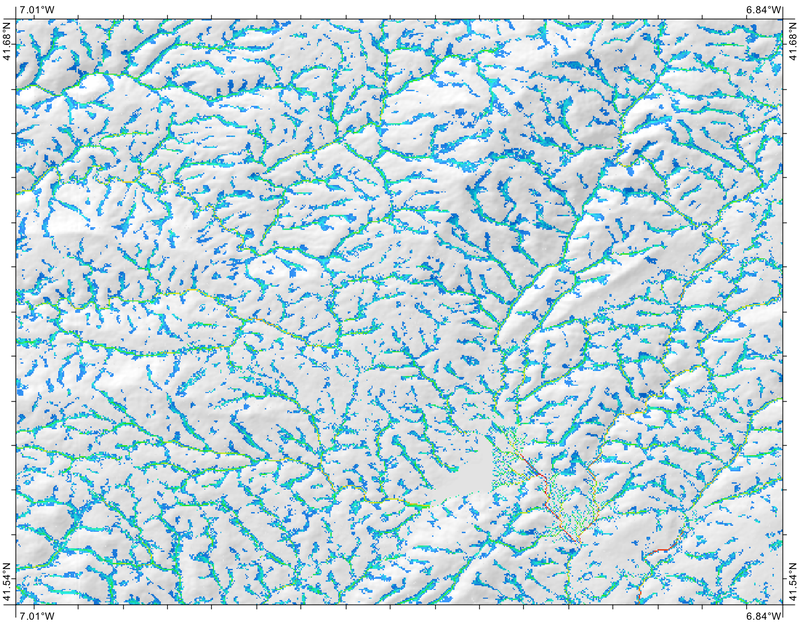 In this case, each grid cell in the raster contains the estimated area in square metres of the impoundment that would result from inserting a 5 m (maximum) high 11 grid cell long dam. There are two parts to the algorithm. The first component measures the height of a potential dam for each grid cell based on the topographic profile perpendicular to the flow line at the site. The second component to the algorithm performs a type of flow accumulation operation. Where most accumulation operations of this type propagate a single value (e.g. 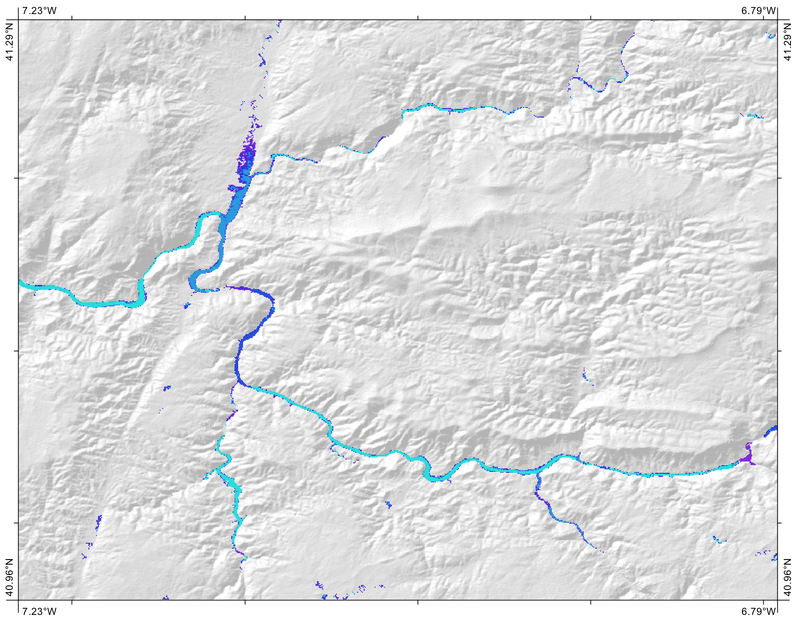 the area upslope) along flow-paths, this algorithm propagates an entire elevation distribution. In that way, it is possible to measure, for each grid cell, the number of grid cells in its catchment that are less than the previously measured maximum dam crest elevation. The really tricky part is how it manages to propagate the elevation distributions to each cell in a computationally and memory efficient manner such that your computer doesn’t explode! The tool is still experimental but will hopefully be officially released in Whitebox GAT v. 3.2.3 or whatever the next update becomes. 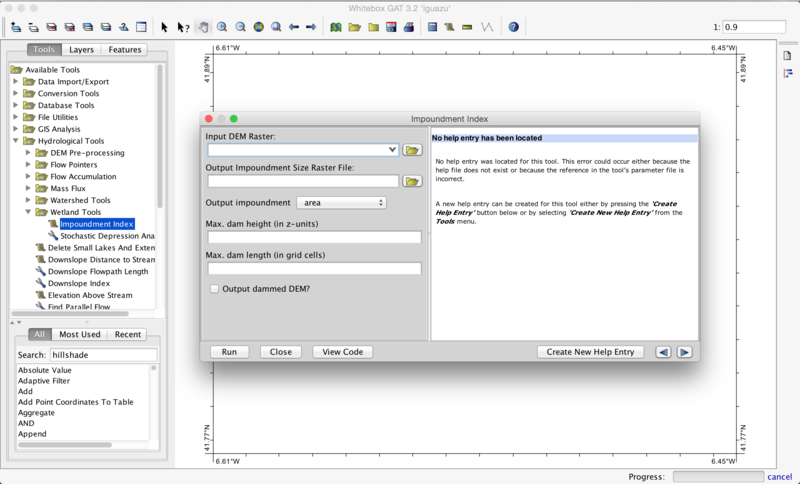 If you can’t wait to play with the Impoundment Index tool, it’s already in the code repository. So you can easily start messing around with it by selecting ‘Update Scripts From Repository’ under Whitebox’s Tools menu. After updating and restarting Whitebox, you’ll find the new tool within the Wetlands Tools and Flowpath Terrain Attributes toolboxes. I’d like to write a paper describing exactly how the tool works in detail in the hopes that other GIS packages will also implement this useful method. Maybe you’ll enjoy this new and exciting function as much as I’ve enjoyed the process of creating it. As always, best wishes and happy geoprocessing.